Want to drive droves of traffic to your social posts? Use clickbait headlines. Want to potentially annoy your followers and readers? Use clickbait headlines. That’s the catch-22 that so many modern marketers face when it comes to their content. They don’t want to contribute to the clickbait epidemic, but they know that a snappy title might be the difference between a flurry of clicks and yet another failed post. Ask a dozen marketers whether or not you should use clickbait as part of your marketing strategy and you’ll probably get a dozen different answers. At the same time, there’s no doubt that audiences have grown weary of the rise of “one weird trick” headlines and other similar cliches. But despite popular belief, it’s possible to increase clicks and shares without resorting to clickbait. Remember that marketers use clickbait as a crutch because they’re more concerned with one-time metrics versus whether or not their content actually delivers. Such is the case of YouTubers who rely on misleading, sensationalist titles in pursuit of shares and ad revenue. 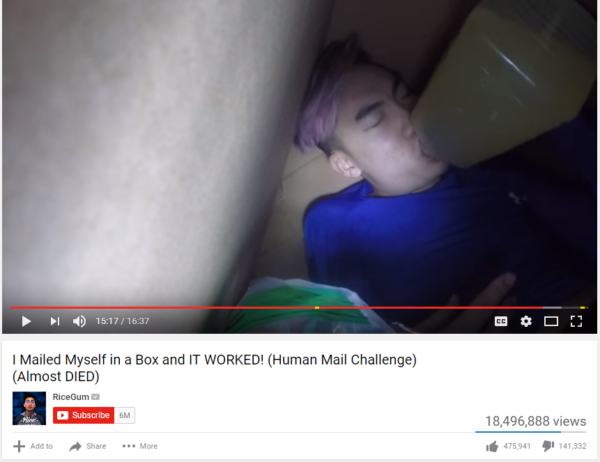 The recent yet short-lived “MAILED MYSELF IN A BOX” trend is a good example of this. Spoiler alert: no participants in this “challenge” actually mailed themselves, obviously. As noted by the mass dislikes for these types of videos, it’s apparent that most modern audiences are unamused by clickbait headlines. This is further driven home by the fact that Facebook continues to crack down on clickbait. Not only that, but being labeled as a potential clickbaiter or spammer could be a potential kiss of death for any given business or brand. Some temporary traffic isn’t worth potentially damaging your reputation in the long-run, is it? If you’re promoting actionable tips, provide actionable tips. If you’re promoting the latest and greatest, your content needs to deliver. In-depth and well-researched content is what gets shared around, not “gotcha” pieces with no substance. There’s a fine line between clickbait headlines and hyping up your content. Hubspot is an awesome example of a brand that’s able to inject their content with a sense of hype. Their recent post “The Greatest Marketing Growth Hack of All Time (Hint: Cupcakes)” illustrates how to effectively hook an audience minus clickbait. The post itself isn’t fluff. It’s an actionable, in-depth piece that relates directly back to its title. 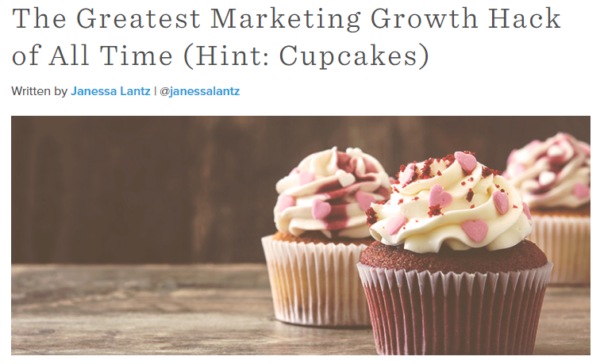 Sure, the author could have just as easily titled the post “What We Learned from Our Latest Survey.” But its current title labels it as a must-read (think: the greatest marketing growth hack) and piques our curiosity (“What the heck do cupcakes have to do with marketing?”). After all, readers don’t want “pretty good” tips. They want the best tips. As long as your content delivers on its promise, you’re golden. In short, don’t ruin your content’s sharing potential by saddling pieces with weak or underwhelming headlines. Copywriting legend David Ogilvy once noted that five times as many people read headlines versus body copy. While you don’t necessarily need to rely on clickbait headlines, ask yourself: how is my piece’s title going to stand out against the competition? Piggybacking on the last tip, your content should present itself as a must-read versus something your audience could potentially sleep on. When in doubt, how-to content is always prime for social sharing. So many readers seek out content in the first place because they need a problem solved, right? Besides, educating your audience via content is a prime positioning strategy and a smart way to encourage more clicks. Striking statements (“110% in 14 days”) and bold claims (“death of journalism”) can make a seemingly ordinary piece seem extraordinary enough to share and click through. Sometimes it pays to step up your vocabulary. 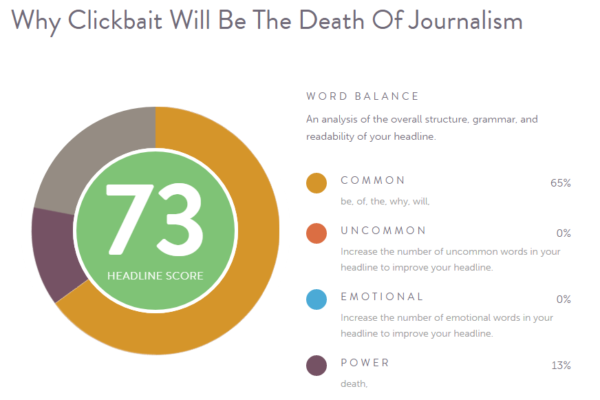 If you want to your headlines to pack a punch, all it takes is a few well-placed words. “Always” and “never,” both of which denote extremes (the USA Today piece “Coconut Oil Isn’t Healthy. It’s Never Been Healthy” garnered over 630,000 Facebook reactions in the span of three days). If you have a hunch that your titles are missing something, there are tools out there that can help assess your headlines. CoSchedule’s Headline Analyzer provides a headline score and offers suggestions to improve your title’s sharing potential and readability. Although such tools aren’t the be-all, end-all of your headlines, they can aid you during the brainstorming and revision process. Sometimes it helps to sit on your headlines for a few days rather than go with your gut. Headlines which address your readers in the second-person (think: “you”) are among some of the highest-performing according to a Buzzsumo study of the most popular LinkedIn posts of 2016. With nearly 5,500 shares, “Will Working Remote Kill Your Career?” ticks the boxes of having a”you”-centric title, posing a burning question to readers and incorporating a power word (“kill”). Content should be produced to appeal to people rather than robots. Headlines centered around “you” and “I” instantly make that ever-so-important emotional connection with readers, even if it’s only on a subconscious level. 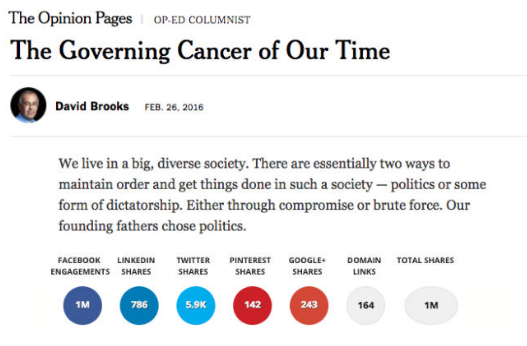 Controversial content represents a surefire way to drive debate, discussion and social shares. That said, marketers should tread lightly when looking to turn controversy into clicks. The lesson here isn’t to go around calling people out or picking fights. Yet if your audience has something you can rally behind, don’t be afraid to use it as fuel for a fiery headline. Although some critics may be bored to death with listicles, the fact remains that they’re here to stay. Although many listicles do incorporate clickbait headlines, not all list posts are created equal. It’s natural to be cynical towards the sort of fare you see on Buzzfeed or Cracked. Even so, the fact that list articles regularly rack up massive shares and comments is rather telling, isn’t it? You’re setting an expectation for your readers. Think about it: when you click on a “7 Things…” or “13 Quotes…” post, you know exactly what you’re getting into. They’re easy to digest. Listicle headlines are especially enticing for mobile users who would rather scroll through a well-organized post versus a massive wall of text. The titles themselves aren’t rocket science. For marketers strapped for ideas, a listicle represents a straightforward way to package just about any piece of content. In short, listicle headlines are a safe bet for marketers and audiences alike. Is There a Future for Clickbait Headlines? Regardless of how you feel about clickbait headlines, there’s no denying that many marketers today are moving away from content that could be labeled as misleading. Although there’s no silver bullet for writing the “perfect” headline, there’s no reason to immediately resort to clickbait anymore. These tips combined can help encourage more clicks and social shares without pulling a fast one on your audience. By the way, what do you think constitutes a clickbait headline, anyhow? Do you think clickbait is a dying breed or is there a time and place for it in modern marketing? Let us know in the comments below.